Our designs are informed by the body, giving nature a helping hand. 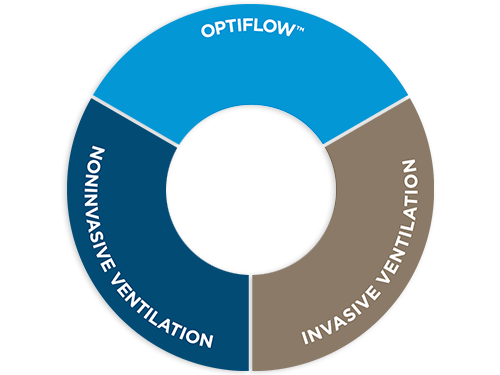 The AIRVO 2 system utilizes leading-edge technology to provide an effective and versatile solution for delivering Optiflow™ Nasal High Flow in all areas of the hospital. Humidification is vital for maintaining the natural balance of heat and moisture in the airways. The delivery of Optimal Humidity for an intubated patient is crucial. Fisher & Paykel Healthcare offers a comprehensive humidified respiratory solution for all therapies in the F&P Respiratory Care Continuum. The F&P Respiratory Care Continuum illustrates the breadth of respiratory therapies patients may require when in need of respiratory assistance.